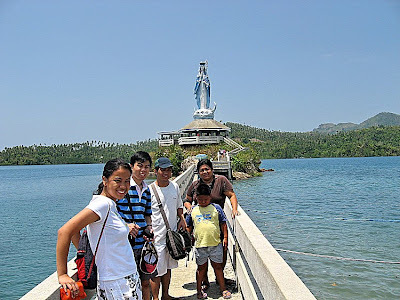 Our trip to Marinduque wasn’t complete without a visit to one of its outlying islands. 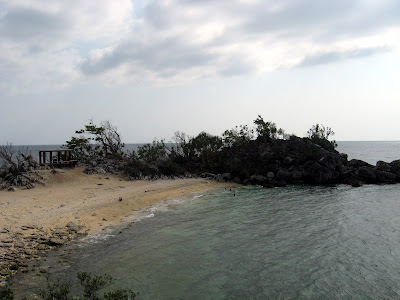 I opted to visit the 8-hectare Nagtangco Island. 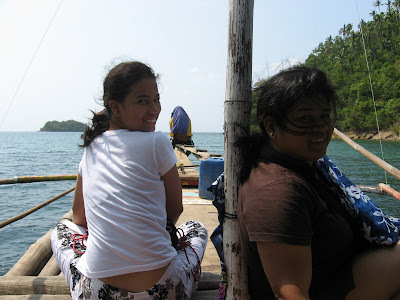 The next day we took a jeepney to Balanacan Pier, one of two ports of entry into Marinduque. Offshore from this fine natural harbor is an imposing statue of Ina ng Biglang Awa (the patron saint of the province). The statue is located atop a concrete view deck which is connected to the mainland by a concrete causeway. Curious, we all made the crossing to the view deck. At the fisherman’s wharf, we approached a fisherman and negotiated for the use of his motorized outrigger boat. We finally settled on the amount of PhP1,000. The boat trip to Nagtangco Island was smooth and uneventful and took all of 30 mins. Nagtangco Island, together with nearby San Andres Island, have spectacular white sand beaches and we still haven’t had our fill of these beaches. However, unlike our Poctoy White Beach visit the day before, the beach where our boat landed was packed with picnickers. Fronting the beach was a concrete resthouse, currently unoccupied, and I approached its caretaker. Along the way, I noticed that the beach on the other side was deserted. 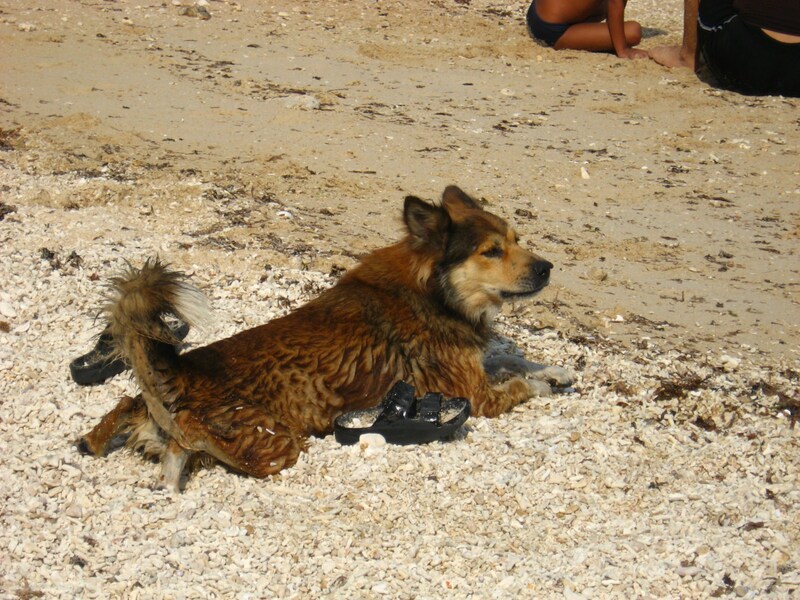 The caretaker told me that the beach I noticed was private and off limits to outsiders. However, with a touch of diplomacy, I was able to get access to this beach. While my companions were enjoying a private, uncrowded swim, I climbed its nearby craggy viewpoint where I had a panoramic view of San Andres Island. 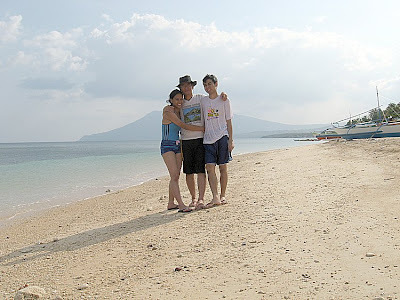 This island visit truly capped our stay in this lovely province. After lunch, we got dressed up, boarded our taxi and proceeded another 30 kms./1.5 hours to the town of Torrijos. Upon entering the town, we made a short stopover at the nearby Pulang Lupa Battle Shrine, site of a Filipino victory during the Philippine-American War. Upon reaching Brgy. Poctoy, we dropped off at the 1-km. long, fine white sand Poctoy White Sand Beach. 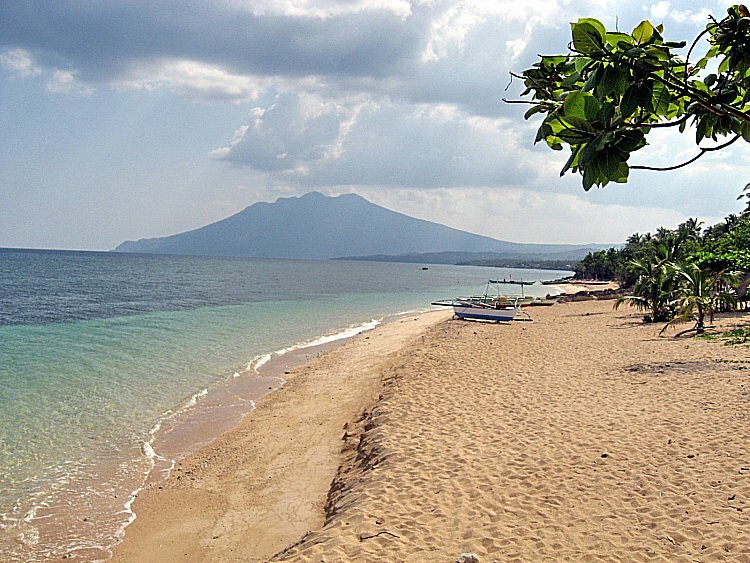 Said to be Marinduque’s best, this postcard-pretty beach, with the dormant, 871-m. high Mt. 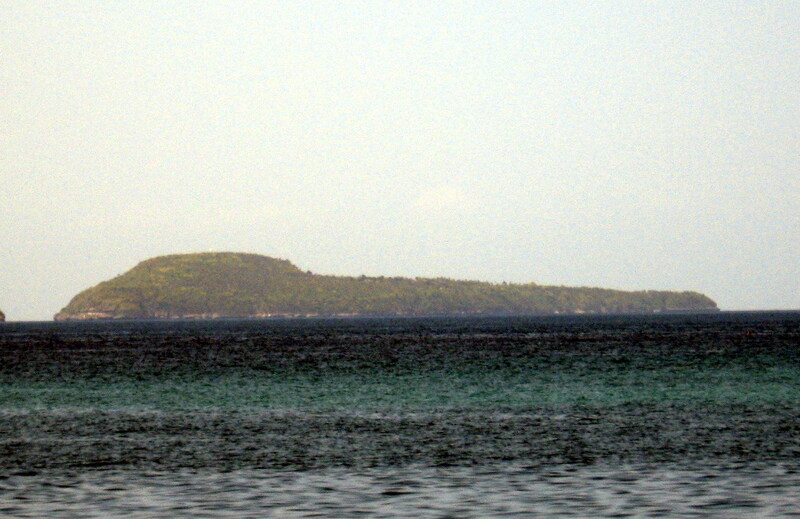 Malindig as a backdrop, was surprisingly deserted it being a Good Friday. The only other people we saw roaming the beach were 2 missionaries from the Latter Day Saints. It seems people here follow the long running rule of no bathing on Good Friday. 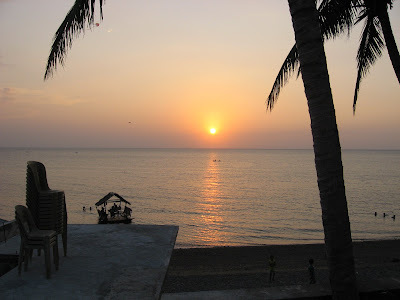 From the beach, we hiked north to a nearby two-room homestay rented out to visiting tourists by Hans Peter Ulrich, a German national, and his Filipina wife Marilou. The homestay was then being rented by 7 vacationing production staff (6 women and a man) of GMA 7’s Starstruck program. The homestay’s 2 rooms were both fan-cooled, had a wide bed with mosquito netting, a bathroom with running water and a common porch and cooking station with a working stove where they can do their own cooking. As there is no refrigerator, they have to go to the market for provisions. Once this need arises, they just call or text, via mobile phone, a tricycle driver (recommended by Hans) who can bring them there. 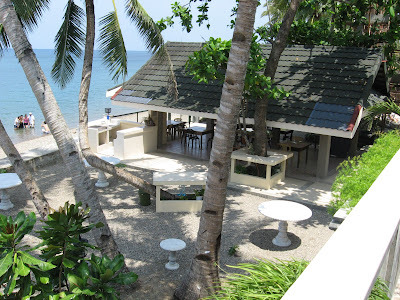 Fronting the cottage is a small, coconut palm-fringed private cove of sparkling white sand and the Good Friday rule did not stop us from frolicking the inviting waters of this beautiful beachfront. Its reef drop-off, located 200 to 300 m. offshore, is ideal for snorkeling. What more can you ask? 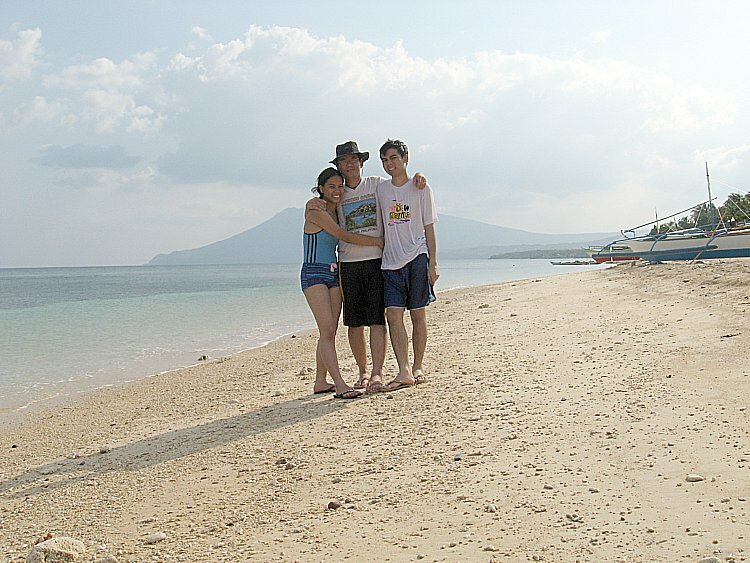 Given the opportunity in the future, I would gladly return to this idyllic beach. Prior to our departure we made a short stopover at the residence of Hans Peter and Marilou Ulrich. Marilou’s Homestay: Brgy. 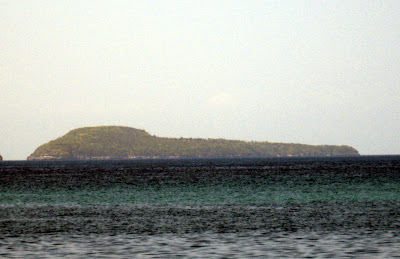 Poctoy, Torrijos, Marinduque. Mobile number: (0921) 751-6930 and (0919) 485-0531. On our second day in Marinduque (Good Friday), we hired a Toyota Tamaraw FX, owned and driven by Mr. Herman Matre, for PhP1,200, to tour us around the island. For food, we brought along packed lunches prepared for us by Ms. Laura Lahm, the owner of Barbarosa Restaurant (said to be the best place to eat in Marinduque). We can actually drive around the island in 3 hours, as the main highway connects all 6 towns, but we opted to do this in a more leisurely pace. 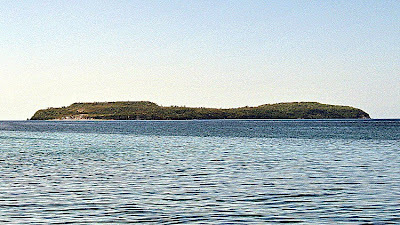 Traveling along the road, we espied, from afar, a number of beautiful islands. The 11-hectare, aptly named Elephant Island, has sheer cliffs, a half-kilometer long white sand beach and a soon-to-open, world-class resort (now Bellaroca Island Resort & Spa). 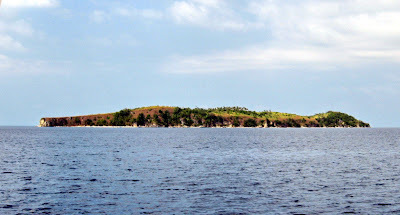 The Tres Reyes Islands consists of Baltazar (also called Pangikol Island), Gaspar (also called Manya Island) and Melchor (also called Polo Island) islands, all named after the Biblical Three Kings. 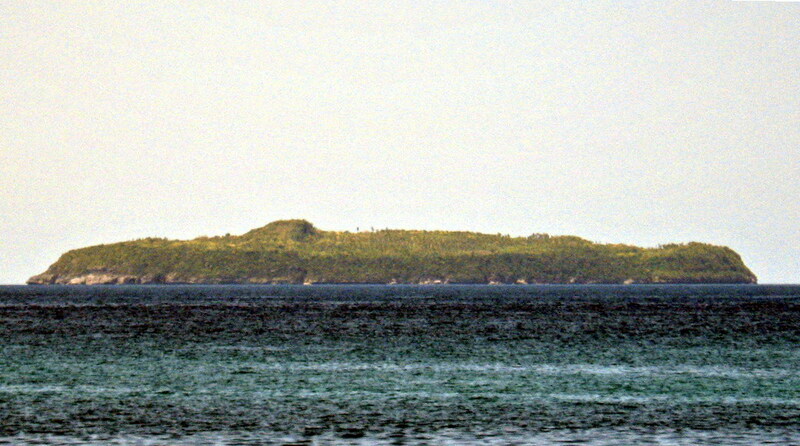 Uninhabited Baltazar and Melchor Islands have steep cliffs and underwater caves. 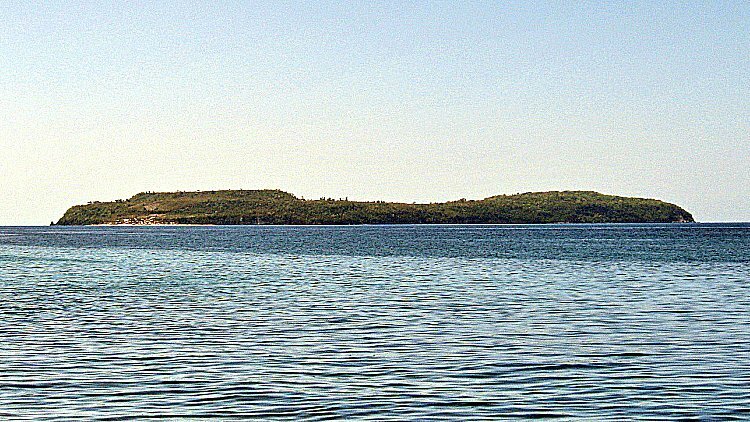 Gaspar Island has a small village, clear blue-green waters and a short, lovely white coral beach which offers fine snorkeling and diving. 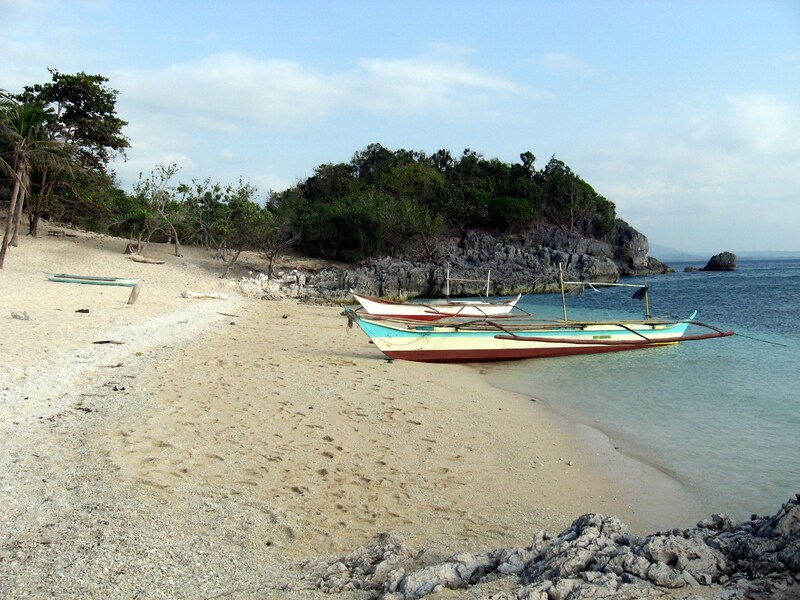 In 1980, the wreck of a 15th century Chinese junk was discovered, in 38 m. of water, near Brgy. Pingan about 100 m. north of the island. A large number of ceramic pieces were recovered including Swatow porcelain, stoneware jars and some iron skillets. All three Tres Reyes islands are ideal dive sites, having several good caves and walls and gorgeous sea fans. Our first stopover would be Malbog Sufur Spring (formerly known as Susana Hot Springs), located a few kilometers inland, at the foot of 1,157-m. (3,797-ft.) high, rarely climbed Mt. 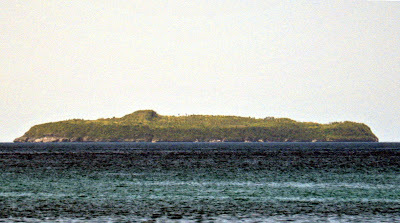 Malindig(with its 3 unique peaks), the highest mountain in the province. Located 3 kms. from Buenavista and volcanic in origin, the spring has 5 main pools with hot therapeutic waters heated by Mt. 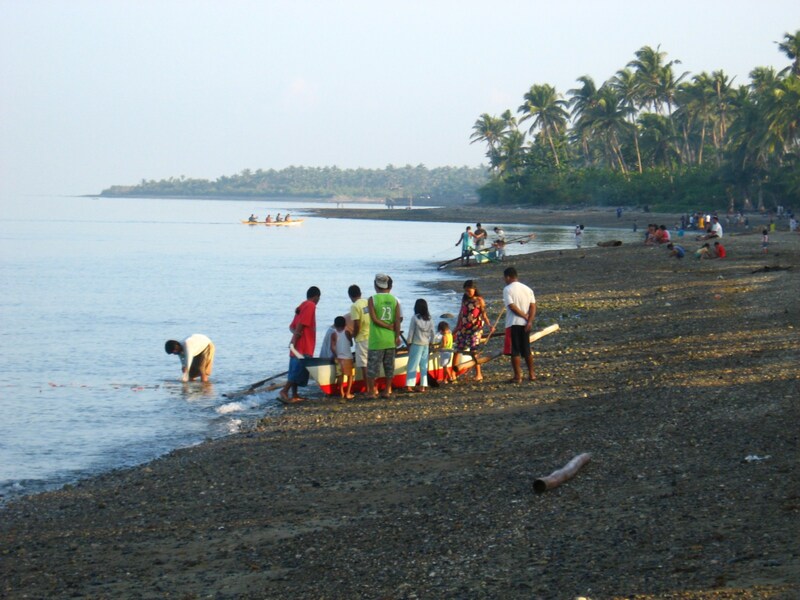 Malindig and said to cure certain skin ailments, a welcome relief for us. 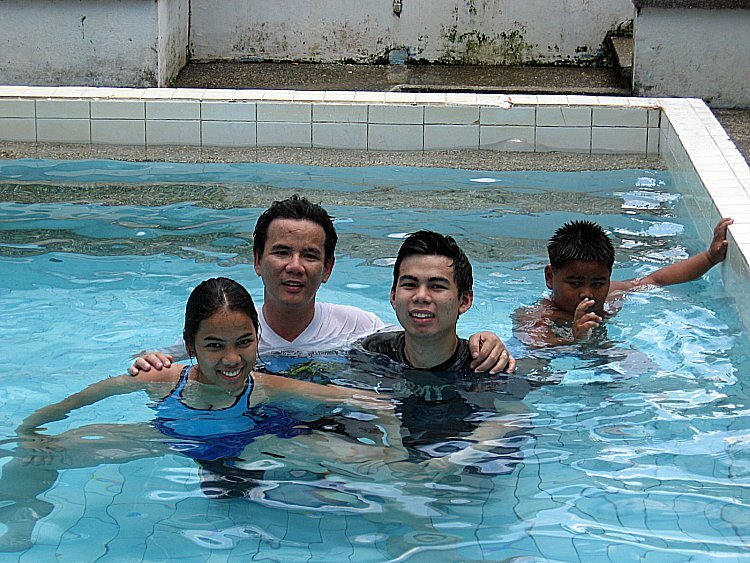 After paying a small entrance fee, we all took a dip in one of its tepid pools. After this refreshing break, we all later partook of our packed lunches. At Boac Park, we had our first encounter with Marinduque’s signature Moriones Festival. 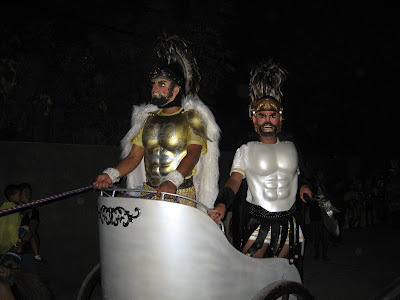 This religious melodrama, held here and in the nearby towns of Gasan and Mogpog, is the province’s main tourist attraction and is based on the legend of the blind Roman centurion, Longinus. 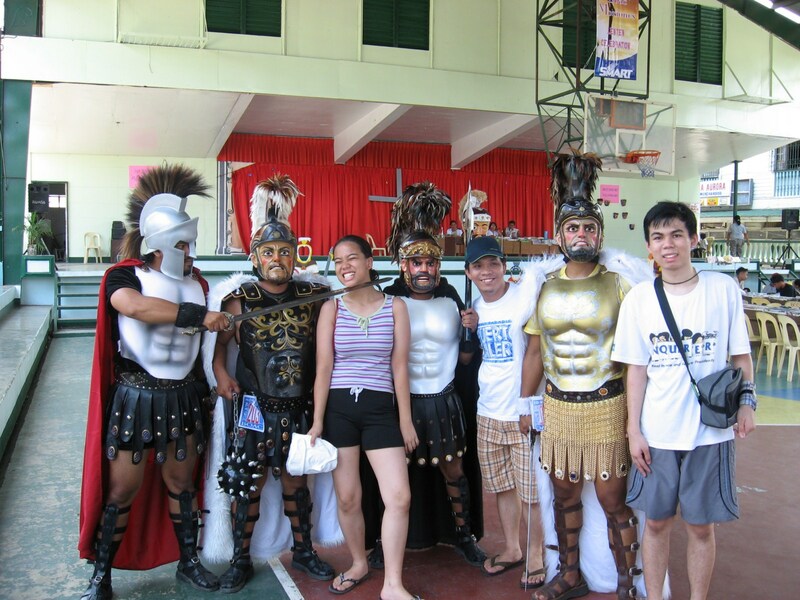 Unusual for a Lenten festival, Longinus, not Jesus, is the focus of the week-long Moriones passion play. According to an often told legend, Longinus (or Longhino in Tagalog), who is blind in the left eye, was the Roman captain who pierced the heart of Jesus to ensure that He was already dead. As he pierced the torso of the crucified Jesus with his spear, blood from the wound spurted into his blind left eye, miraculously curing his blindness. While guarding Christ’s tomb, he also witnessed His resurrection. From then on, he attained faith and goes around town spreading the news of Christ’s divinity and the testimony of the miraculous healing of his blindness. The Roman authorities found his testimony seditious and ordered his immediate arrest. Longinus is forced to flee but, after long searches, is captured not once, but thrice, escaping each time. He is finally captured, for the fourth time, on Easter Sunday, brought before Pontius Pilate, tried and then executed by beheading. 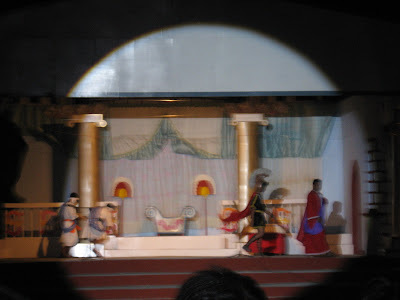 The passion play’s origin is uncertain. Some say it originated from Mexico, being brought here in 1870 by Jesuit Mexican priest Fr. 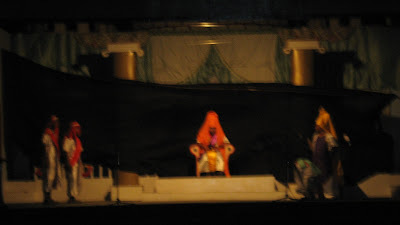 Pedro Santiago to dramatize the power of the Christian faith and to attract the rural population from the interior to participate and be converted to Christianity. 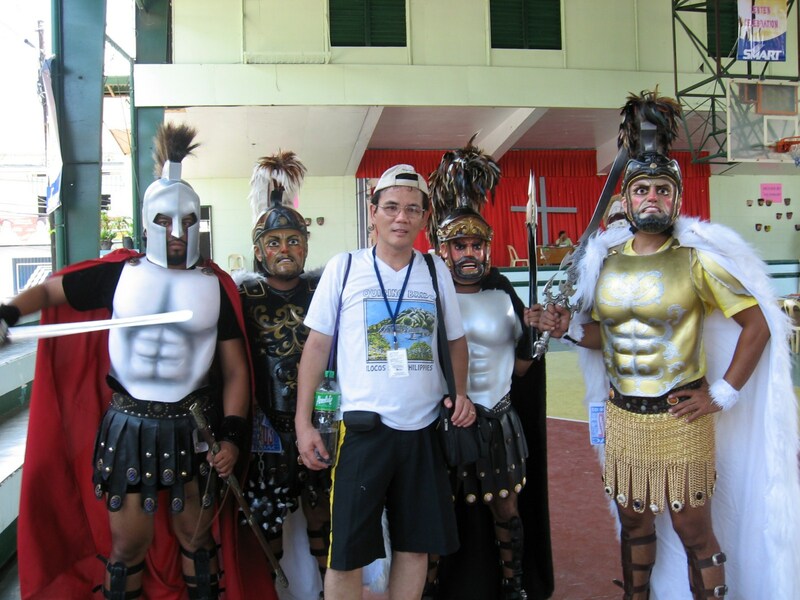 Mompog also prides itself with being the origin of the Moriones Festival (as well as the Tubunganceremony). 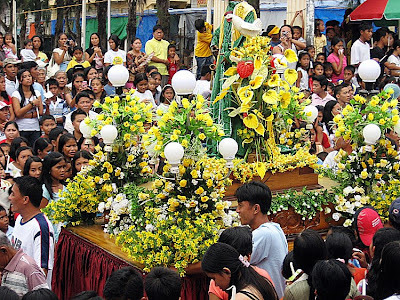 However, the festival is also said to have originated from the town of Gen. Luna in Quezon, located 240 kilometers from Manila and 103.34 kilometers from Lucena City. 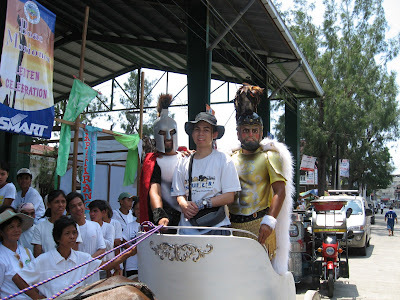 Even today, the town reenacts the Centurion at ang Bahay na Kubol during Holy Week with Lenten parades of senturyons and a reenactment of the 14 Stations of the Cross. 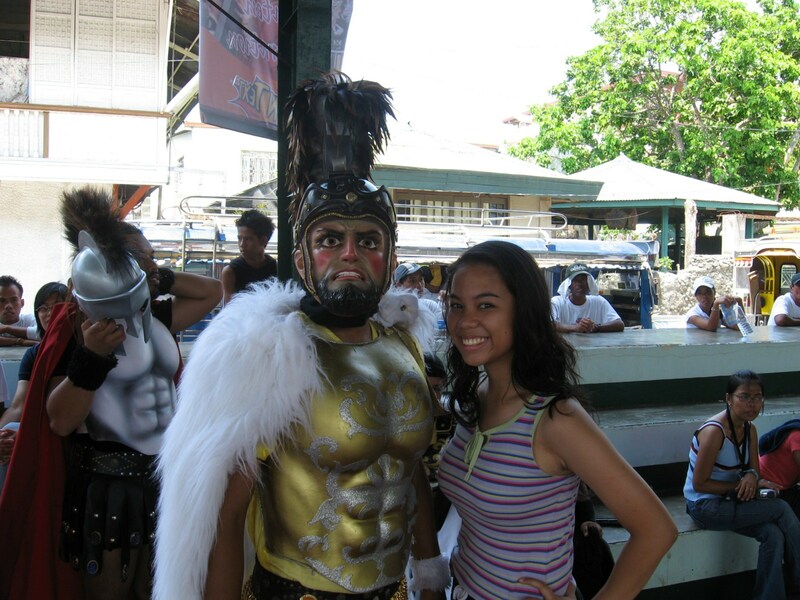 The park was teeming withe the festival’s main characters, the moriones (the word morion relates to the centurion’s helmet, mask or visor). They wear ingeniously outlandish, homemade Roman soldier costumes (close-fitting jackets, feathered helmets, thong sandals and capes). The fantastic helmets are decorated with colored paper and tinsel flowers. The colorful but grotesque masks are carved from a light native wood called dapdap and painted with faces that are neither good or kind-looking. Longinus’ mask is the one with the blind left eye. These “Roman” soldiers, mostly antipos (penitents atoning for sins or persons giving thanks for answered prayers, good harvest or cured illnesses) accompany Jesus on the way to his crucifixion. Longinus is usually played by an old but nevertheless strong man. At the park, we gamely posed with a number of these moriones. Other “Roman” soldiers were roaming the streets, beating indigenous kulatangs and chasing or scaring onlookers by thrusting their swords and spears, an act believed to drive away evil spirits. They also play pranks on people, sing to the ladies or even engage in mock duels with their swords. Some were riding Roman chariots. 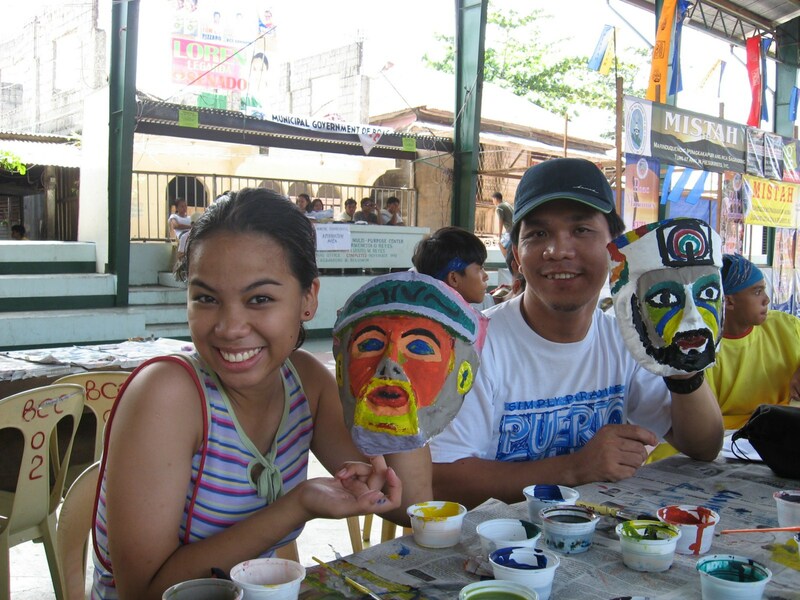 At the park gymnasium, Cheska, Jowel and Yor also joined a “Maskara Mo, Kulayan Mo!”mask painting contest. Cheska was later informed, by text, that she was among the winners chosen. 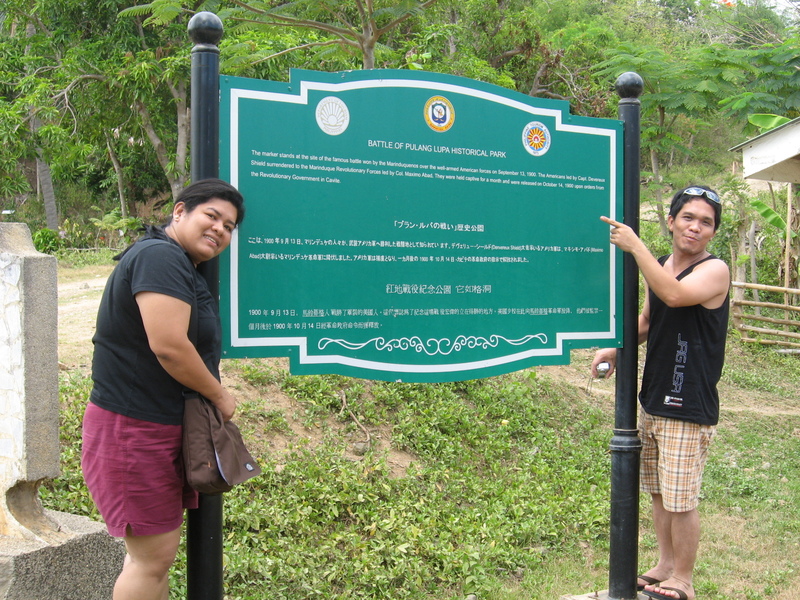 We next proceeded to Boac Park, the execution site of Filipino revolutionaries and the surrender site of Col. Maximo Abad and his 300 Filipino soldiers during the Philippine-American War. 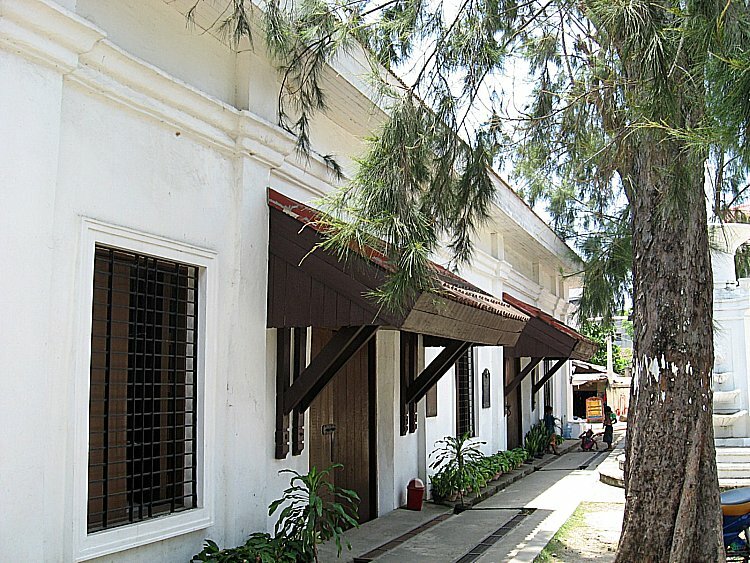 Within the park grounds is the Marinduque National Museum branch. Housed in an old, historic building built in 1887, it was formerly used as a boy’s school, jailhouse, a library and the Municipal Trial Court Building. The museum, opened on February 22, 1995, showcases the province’s cultural and social heritage. Cheska and Jandy at the museum’s staircase. Luckily for us, the museum was open in spite of today being Holy Thursday. 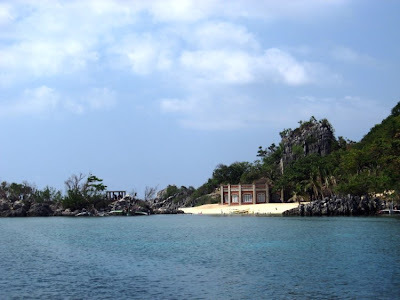 Its displays include artifacts found in caves, shells, vintage photos, antiques, Moriones masks, costumes and pieces retrieved from galleons still buried under the waters between Pingan and Melchor Island. Marinduque National Museum Branch: Boac Park, Poblacion, Boac, Marinduque. Open Mondays to Fridays. Admission is free. We first visited, via a short hike up a hill, the fortress-like Cathedral of the Immaculate Conception. Built in 1656, this church houses the statue of the miraculous Ina ng Biglang-Awa (translated as “Mother of Instant Mercy”), the province’s patron saint (since 1792) to which is attributed deliverance from a 19th-century Moro attack. The revolution’s flag was brought here by Canuto Vargas to be blessed in 1899. 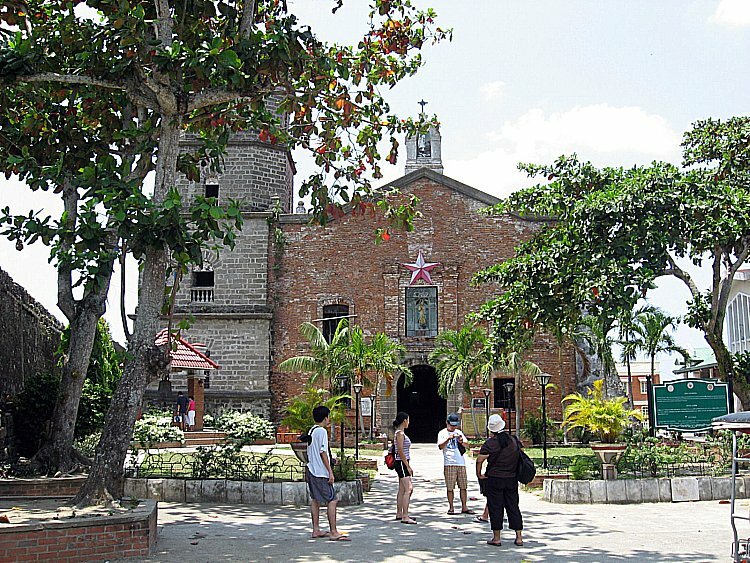 The cathedral has a simple brick facade and a 4-storey (square at the first 2 storeys and octagonal at the upper 2) bell tower on its left. Its carved wooden portals are decorated with flora and fauna, cherubs and the images of the Four Evangelists: John, Luke, Mark and Matthew. 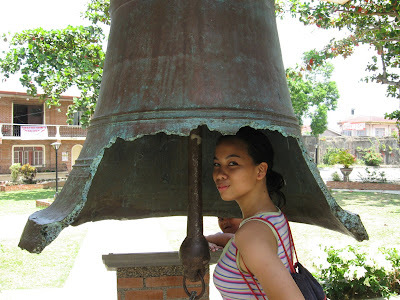 Within the church grounds is an old, broken bell. As the church doors were locked, we weren’t able to see the church’s well-maintained and faithfully restored interior said to have brick walls, wall-hung period lamps, a ceiling with designs of Muslim brass gongs, two sets of Stations of the Cross (in wood and stained-glass windows) and three richly decorated and intricate retablos (altar backdrops). Once settled in our suite at Villa Carlos Resort, we prepared breakfast at the balcony, cooking (not allowed though) canned food which we brought along for the trip using my portable stove. That done, we now left the resort to explore Boac in detail. 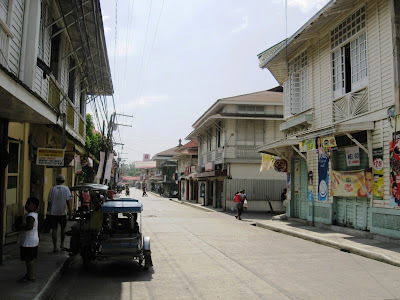 The town proper had many large, high-ceilinged Spanish and American-era ancestral houses, some well-preserved and others dilapidated and in need of repair. 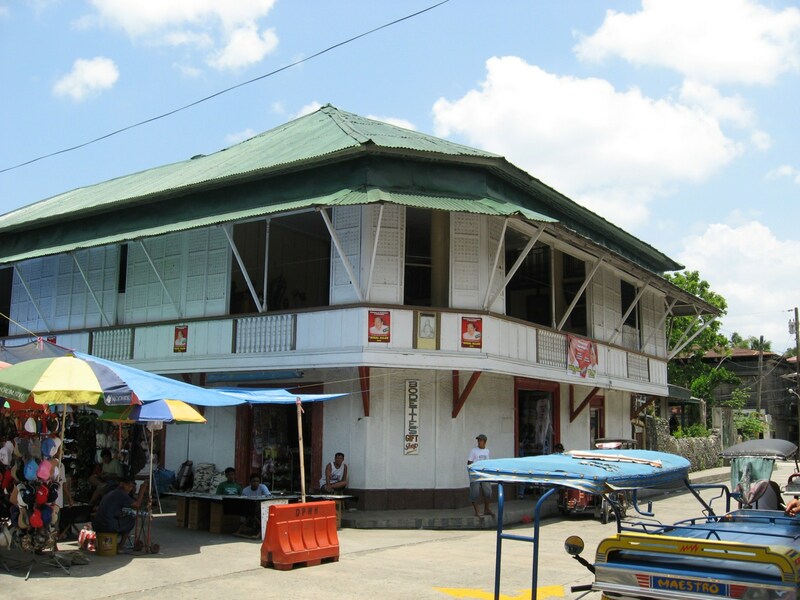 Many have capiz windows, ventanillas and double roofs with unusual braces reminiscent of braces used to prop up windows in nipa houses. 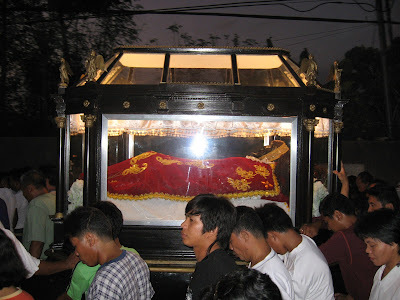 Once on terra firma, we boarded a jeepney at Balanacan Pier for Boac, the provincial capital, all the while hoping that there would be accommodations available at this unholy hour when everyone was supposed to be asleep. As I feared, there were none available at the town proper, it being the holiday season. Soon all the passengers had alighted from the jeepney save for us. Our jeepney driver suggested a beach resort and dropped us off at Villa Carlos Resort where the caretaker allowed us to pitch tents by the beach. It was now 1:30 AM. Jandy, Verner, Jowel and Yor slept inside the tents while Cheska and I slept out in the open, on benches at a nipa and bamboo picnic shed. 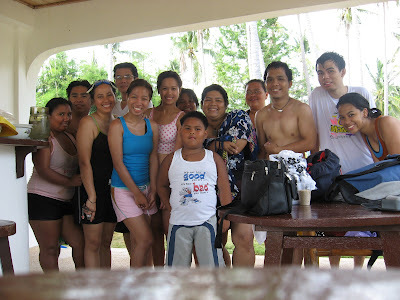 Come morning, I had a chat with the affable resort owner, Ms. Emily Ignacio-Alaan. Fortune smiled at us that early morning as Ms. Alaan allowed us to use, after a guest canceled their booking at the last moment, an airconditioned suite with 3 king-size beds, a small TV, compartmentalized bathroom (shower and water closet had separate compartments with the lavatory between both) and, best of all, a private balcony (with a round marble table and monobloc chairs) overlooking the sea. The room was rented out for PhP1,600 a night, way over our spartan budget, but Ms. Alaan agreed to halve the cost provided we didn’t use the room airconditioner. This suited us fine, as the cool evening breeze negated the use of airconditioning. 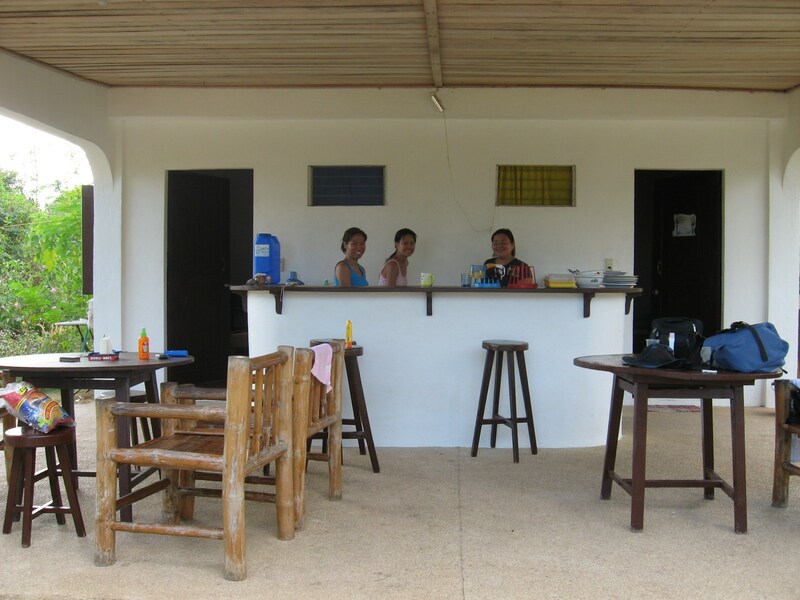 The resort also had a restaurant and a videoke (which gladdened Jowel). A covered badminton court was still being built during our stay. The suite’s balcony was perfect for viewing the gathering of tuba (coconut wine) in the morning, people frolicking along the black sand Ihatub Beach in the afternoon and, come dusk, a beautiful sunset. Cheska, Vener and Yor opted to sleep here, the balcony being cooled by the sea breeze in the evening. With our accommodation worries out of the way, we could now explore, using the resort as our base, this beautiful-island province in detail. 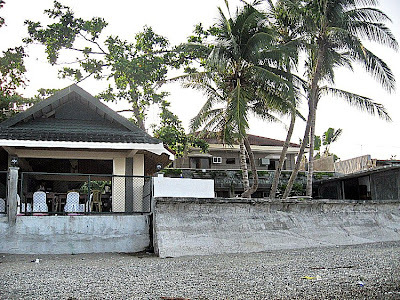 In 2007, management of the resort changed hands and the resort was renamed Villa sa Aplaya Beach Resort. 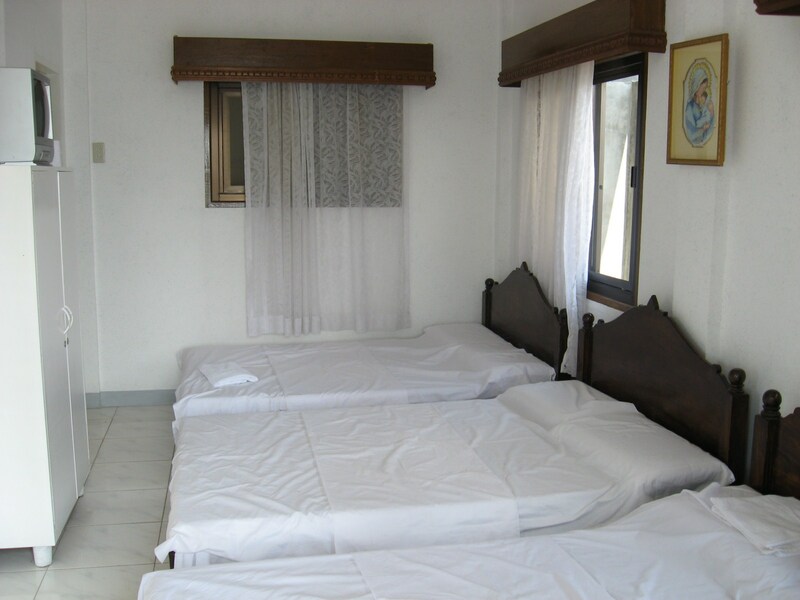 It now has 11 airconditioned rooms with bath, 21″ cable TV and refrigerator plus, aside from the abovementioned facilities, a 25-pax conference room. The badminton court is now operational. 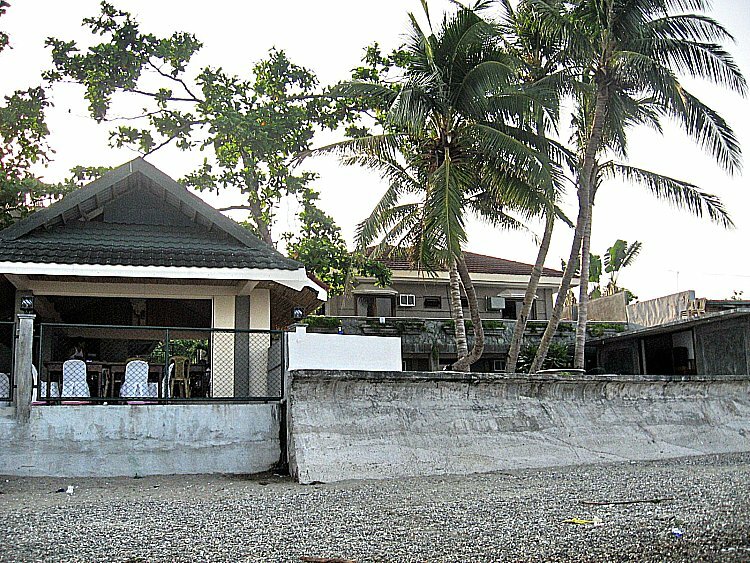 Villa sa Aplaya Beach Resort: Brgy. 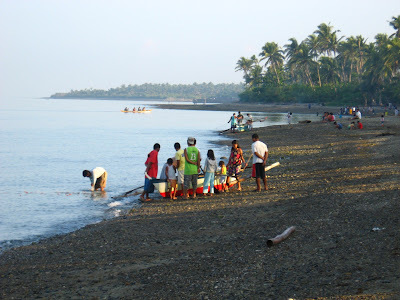 Ihatub, Boac, Marinduque. Tel: (042) 332-1881 to 82.